At La Janda, our small partner school in Vejer de la Frontera, you are assured of personal attention. The school is situated in a beautiful Andalusian house in the old town of Vejer. The school building itself is quite special, an Andalusian town house turned into a school, with a kitchen, library, computer room, free WIFI and balconies and patios, with spectacular views over the natural park. La Janda offers an extensive activity program, with cultural visits and sporting activities. Examples of such activities or excursions are: workshops on Spanish customs and traditions, sports activities such as swimming, surfing and beach volleyball, tapas tour, film night at school, Flamenco dance lessons and cooking classes. You have lessons with students of the same age (13-17 years) from different nationalities. The course consists of 20 lessons per week in groups of up to 10 participants. 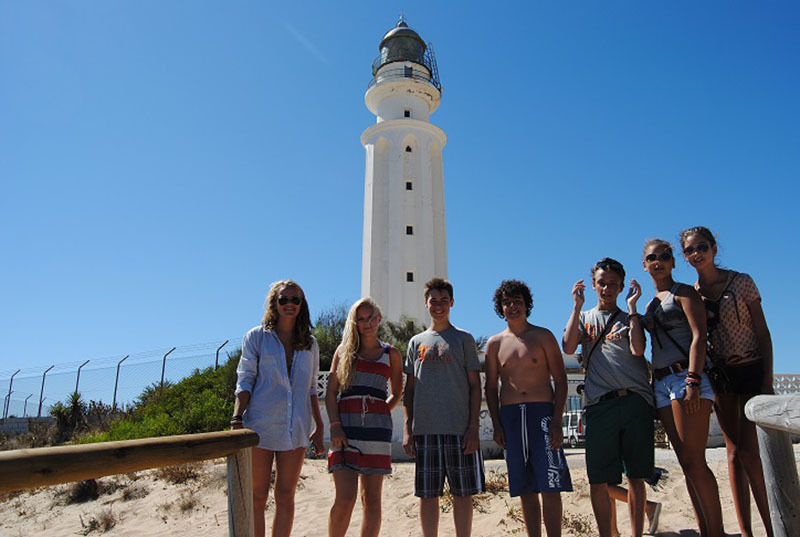 .It offers you the chance to study Spanish in a safe environment near some of Spain´s most beautiful beaches. The prices include a full day excursion (every Saturday), a half-day excursion and a daily activity program (with beach activities, sports, barbecues, Flamenco lessons, parties, visits to places of local interest, etc.). With one week, the stay is from Sunday to Sunday, the Saturday full day excursion is included. with more than one week, the stay si from Sunday to Saturday. Last course day is 30/08/2019. Your stay is in a twin room which you will share with another student from the language school. Lodging is based on full board. With one week, the stay is from Sunday to Sunday, the Saturday full day excursion is included. If you stay longer, the stay is from Sunday to Saturday. There are several airports to reach Vejer de la Frontera, but Sevilla is the most common. Therefore the price for this airport transfer is mentioned here. on arrival in Málaga € 225,- p.p. on arrival in Jerez de la Frontera: € 85,- p.p. With one week, the stay is from Sunday to Sunday, the Saturday full day excursion is included. with more than one week, the stay si from Sunday to Saturday. In 2019 the school is closed on 15/08/2019. Missed lessons will not be rescheduled but you can participate in the activities in the afternoon. During your course you will stay with a host family. All meals (breakfast, lunch and dinner) are included. You will share your bedroom with another international student from the language school. The families live within walking distance of the school and are are carefully selected by the school and with many families the school has been working for a long time. Accommodation is from Sunday to Saturday, except for the course of one week which runs from Sunday to Sunday, that way you can participate in the full day excursion on Saturday.